This Christmas, cookbooks are competing with more serious works on Nelson Mandela in South African bookshops. This was triggered after the icon's personal chef has published a collection of her choicest dishes. Xoliswa Ndoyiya's book, "Ukutya Kwasekhaya (home cooking) - Tastes from Nelson Mandela's Kitchen" gathers 62 recipes with short family anecdotes about the hero. The book offers recipes from lemon Brussels sprouts to curried mango rice salad, paella, nine kinds of soup, orange turkey, various chicken dishes, and mama's meatballs. "Those are not all my recipes. I do have more than that!" said the 49-year-old chef, smiling. Also known as Xoli, she caught the cooking bug from her grandmother, who cooked for a white family. Xoli's story sadly is typical of many black South Africans. Brought up in a rural township, she found a job as domestic worker first with a white family in Johannesburg, then in a Jewish old age home. Her first husband was killed in the township violence between Mandela's African National Congress (ANC) and a rival contender for power, the Zulu Inkhata Freedom Party (IFP), in the early 1990s right before the end of apartheid. Her second husband died in a car accident. The chef's four children were raised in the countryside by her mother and sister, 800 kilometres (500 miles) from Johannesburg. But then Xoli met Mandela. A friend pulled a few strings and she got the job as his cook in 1992, two years before Mandela won South Africa's first multiracial general elections and became president. Since then, Xoliswa Ndoyiya has fed not only the statesman, but also his family, ANC leaders, foreign heads of state and famous visitors like Michael Jackson. American talk-show queen Oprah Winfrey was especially fond of Xoli's creamy potatoes, it seems. Home cooking is Xoli's trademark, as the book's title suggests. Like Mandela, now 93-year-old, frail and living back in the Eastern Cape village he left as a youngster, she too is Xhosa and also hails from this impoverished province in the south of the country. And she followed him when he left Johannesburg in July to return to his home town of Qunu. "Wherever he goes, I am going with him," she said. The Mandela family adopted Xoli as one of their own, and she even mothered the grandchildren "Madiba" -- Mandela's tribal name -- had living with him, while her own children were far away. 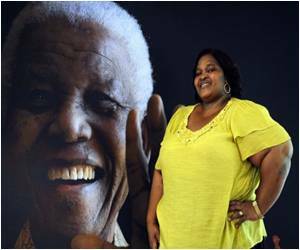 Under her watch, Mandela's table turned into a culinary melting-pot, integrating traditional Xhosa cuisine, South African classics like sour milk (amasi) and Jewish dishes she learnt from her previous employers. There were also some foreign influences, like kid-pleasing hamburgers for the children and some hearty Italian lasagna dishes. The chef's cooking continues to evolve, with for example, the addition of garlic after Mandela married Graca Machel in 1998, the widow of former Mozambican president Samora Machel -- garlic being a key ingredient in dishes of the former Portuguese colony. And what about Mandela's taste? "He eats whatever I cook!" she said, adding that South Africa's first black president has a weakness for peppery dishes. "But he prefers the traditional fare. If you don't give it to him for a few days, he will ask: "What's wrong? Why are you not feeding me well?" According to Xoli, some of Mandela's favourite dishes are oxtail stew (umsila wenkomo), maize kernels or samp with beans (umngqusho), or tripe (ulusu), all in the cookbook. Another favourite, lamb head and tongue, was not included in the book. The cook becomes emotional when she recalls one episode when she sent umphokoqo (maize meal porridge with sour milk) by plane to London because Mandela had had enough of English cooking. "Ukutya Kwasekhaya", co-written with food critic Anna Trapido, is one of the few cook books in South Africa that includes recipes of traditional African dishes.